The Gold American Eagle coin program is the official gold bullion product of the United States of America. Bearing iconic American symbols on both the reverse and obverse sides, it is a standard bearer for American power and democracy around the globe. Each year these coins are struck in bullion, proof, and burnished versions. 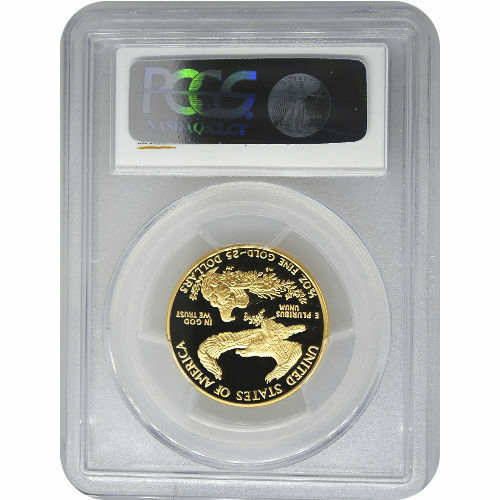 Today, the 1988-P ½ oz Proof Gold American Eagle coin is available in perfect condition on Silver.com. Second annual release of the ½ Gold American Eagle! Consists of an actual gold weight of one-half troy ounce. Face value of $25 (USD) is fully backed by the United States government. Issued a Proof 70 grade from the Professional Coin Grading Service. Features a “P” mint mark from the Philadelphia Mint. Congress authorized the Gold American Eagle coin program in the same year it passed legislation authorizing its silver counterpart, the Silver American Eagle. Gold American Eagle coins were first unveiled in 1986 with both a bullion and proof version. While the bullion version of the coin debuted with four total weights, 1 oz, ½ oz, ¼ oz, and 1/10 oz, all in the first year, the fractional weights were phased in over three years for the proof version. In 1986, the mint released only a 1 oz proof coin. The ½ oz coin was introduced for the first time in 1987, followed by the ¼ oz and 1/10 oz coins in 1988. On the obverse side of all Proof Gold American Eagle coins is the image of Lady Liberty as she strides forward from the national capital of Washington DC. Marching toward an unknown future, she holds a torch aloft in her right hand, exuding freedom and confidence as her robes and hair flow in the breeze. The reverse bears the image of a male bald eagle flying over its nest, which contains a female bald eagle closely guarding a pair of hatchlings within. 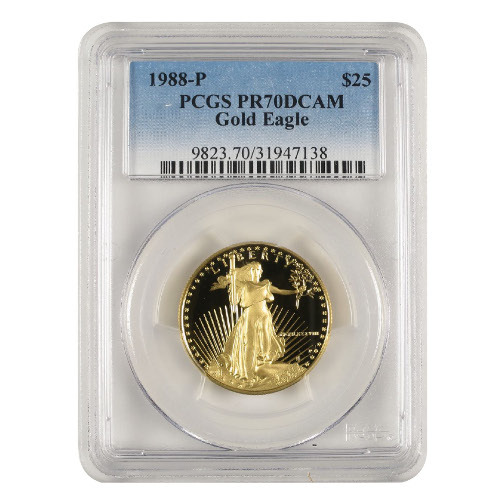 Each 1988-P ½ oz Proof Gold American Eagle in this listing is in perfect PR70 condition. The PCGS considers each coin to have its full, original luster, and observed no blemishes of any kind on its surface. Deep-cameo describes a proof coin with a frosted design set overlaying a mirror-like background. Proof Gold American Eagle coins are sought after in anticipation for gold’s continued historic value, which you can monitor minute by minute via our active charts that show the spot price of gold.